Regional net-sand-thickness maps of the Navajo Sandstone are poorly documented in the literature. 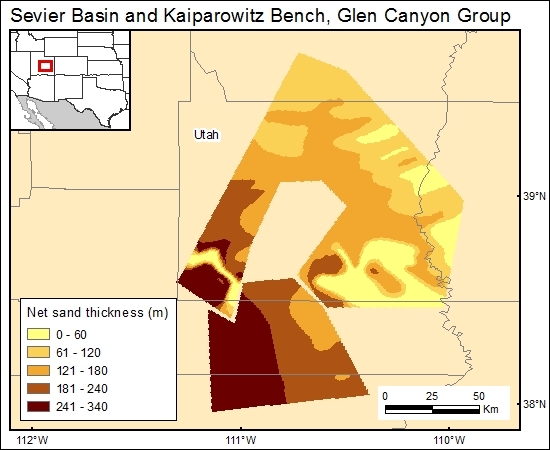 However, detailed net sand thickness of the Navajo Sandstone in the southeast part of Utah (Kaiparowitz Basin and San Rafael Swell) were provided by Hood and Patterson (1984). Hood, J. W., and Patterson, D. J., 1984, Bedrock aquifers in the northern San Rafael Swell area, Utah, with special emphasis on the Navajo Sandstone: Utah Department of Natural Resources Technical Publication 78, 128 p.